The HI 93750 is an ideal solution to the determination of potassium concentration in the field. Potassium as a chemical element is commonly found in nature. It is present in soil and drinking water. It is also an essential element for the growth of plants and animals. The concentration of potassium is important in determining the quality of soil in applications such as greenhouses, agriculture and horticulture. Potassium salts are also a common component of fertilizers. 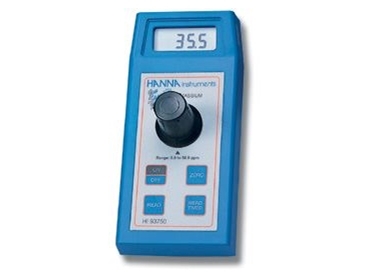 The Hanna HI 93750 photometer measures potassium quickly in the 0 to 50 mg/L (ppm) range. It is easy to use, even for non-technical personnel. The HI 93750 is an ideal solution to the determination of potassium concentration in the field. HI 93750 is supplied complete with 2 cuvets, battery and instructions.